Creators: Gardner Fox (writer) and Bert Christman (artist). timed right to be among the very first of the superheroes that followed in the wake of comics' first break-out hit, but he didn't much resemble the others with their colorful tights — at least, not at first. The Sandman was Wesley Dodds, one of those wealthy idlers who put on costumes to hide their identities while combating evil. They're not uncommon in comic books (e.g., Batman), but the genre far pre-dates comics (e.g., Zorro). Like The Green Hornet, the pre-comics urban adventurer he most resembled, The Sandman's outfit consisted mostly of a broad-brimmed hat, mask, and cloak to cover his ordinary business suit. In his case, tho, the thing covering his face was a gas mask, to protect himself from the sleeping gas he routinely used on suspects (hence, the name). His series began in the 40th issue (July, 1939) of Adventure Comics, a monthly anthology published by the company that developed into DC Comics. During its four-plus decades of publication, Adventure featured Starman, Supergirl, The Legion of Super Heroes, and many other costumed do-gooders including another one named Starman, but The Sandman was the very first. 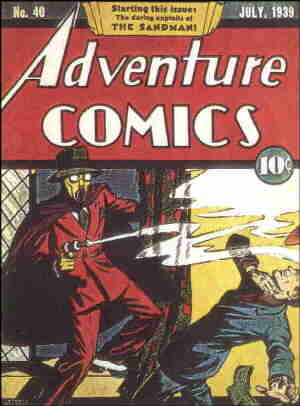 Adventure Comics #40 wasn't quite the character's first appearance, tho. The 1939 issue of New York World's Fair Comics, an extra-big anthology DC put out to capitalize on the eponymous event, contained a Sandman story, and probably hit the stands a week or two before his first Adventure story (tho the one in Adventure is believed to have been written and drawn earlier). Both "first" appearances were written by Gardner Fox (who also wrote the opening stories of The Flash, Doctor Fate and many other DC characters, from the 1940s to the '60s) and drawn by Bert Christman (whose prior credits include Scorchy Smith, but who has few subsequent ones because he died in World War II). The artist most associated with the character's early adventures is Creig Flessel (Shining Knight, Speed Saunders). It was Flessel who drew his stories in the first few issues of All Star Comics — including #3, in which he became a charter member of The Justice Society of America. Paul Norris (Jungle Jim, Brick Bradford) was drawing him in #69 (December, 1941), when the series underwent a radical change in direction. Dian Belmont (his girlfriend, who knew his secret identity) was killed, and he adopted her nephew, Sandy, whom she'd been raising. He changed from his old generic mystery man outfit to a skin-tight, purple and yellow number Dian had designed for him, and Sandy put on a similar outfit to become his sidekick. After that, he fit right in with the rest of the super guys that dominated comic books of the time. But the change came too late to save his spot on the cover, which Hourman had squeezed him off of back in #48. Three issues later, production of Sandman & Sandy stories was taken over by the Joe Simon/Jack Kirby studio, which had created Captain America for Marvel Comics, and Blue Bolt for Funnies, Inc. This was their first work for DC, where they later did Manhunter, The Boy Commandos, The Newsboy Legion and (decades later) a completely different character called The Sandman. Interest soared, and as of #74 (May, 1942), The Sandman & Sandy were back on the cover. They stayed there until #102 (March, 1945), after which the superheroes of More Fun Comics (Superboy, Aquaman, Johnny Quick and Green Arrow) suddenly moved en masse into Adventure, and most of the ones that had previously occupied Adventure Comics disappeared. By the time The Sandman was seen again, in one of the 1960s annual team-ups between The Justice Society and The Justice League of America, a couple of changes had taken place. He was back in his old gas mask costume, and Sandy had been mutated into a destructive monster. He was later de-mutated, and the two became, like many of the 1940s superheroes, minor background elements of DC's universe of characters, available for guest shots, specials and other use, but mostly left alone. The Sandman was later killed off, and Sandy became a Justice Society member. In the 1990s, he was revived as a '30s period piece. Sandman Mystery Theatre, by cartoonist Matt Wagner (Grendel, Mage), was published by DC's Vertigo imprint, which specializes in darker stories for a more mature audience. In this series, Dian is alive, Sandy is as yet unheard-of, and there are no purple and yellow tights. He fought crime in this manner far longer than he did in his original series, 70 issues in all, running from May, 1993 to February, 1999. Meanwhile, DC launched another character called The Sandman, but this one is neither Wesley Dodds nor the guy Simon and Kirby introduced decades later — he's The Sandman, Lord of Dreams, Death's Younger Brother, and all that. Both of the earlier Sandman characters are tied in, at least peripherally, but there isn't really any connection. Text ©2003-11 Donald D. Markstein. Art © DC Comics.